This is my detailed review on the WORX WG517E electric leaf blower. This model came out at number one on our top 5 list of electric corded leaf blowers, based on the highest customer satisfaction rating. That alone speaks volumes for just how good this product is at helping you quickly cut down the time spent cleaning up a garden or a lawn, that has been covered with leaves. You can see from the image just below, that this is a good looking blower, and according to the many buyers does an excellent job, in a very short space of time. Below you can read a detailed review on this WORX blower, but for those who don't have the time, I have completed a short summary review just below. For those of you who would like to find out more, then please keep reading as we get into a lot more detail in the main review just below. In this section we dig into the details of this WORX branded model. In summary it is a leaf blower and it does not vacuum and it does not mulch. It simply blows, but boy does it blow. The speed on the highest setting gets up to a pretty amazing 120 mph. This blower is excellent at what it does, but please don't buy this one if you are also looking for a leaf blower that vacuums as well. If you want one that does both, then please check out our top 5 list of leaf blowers and vacuums by clicking here. The blow on this leaf blower is truly amazing, but it is a leaf blower and can not be used to vacuum and it does not mulch or shred either. The WORX WG517E Electric blower uses Turbine Technology to really gear up the amount of air movement. This allows you to move more leaves fast and more efficiently. It has speeds of up to 120 Mph, with a 13m³/min air force. This of course can be controlled as it has a variable speed setting which gives you more control in corners and tight spots. You can find out great information about any product if you have the time to read all of the reviews. This is what we do here at this website. Normally we present this in a Pros and Cons table. In this case there would be no point as having read all of the reviews, no buyers gave this a bad rating. We read about 90 reviews and we found one bad review. However when we read the review the buyer said the blower was great, so clearly they gave this one the wrong star rating. We have rated this one as a 9 out of 10 product as in terms of power and ease of use, this leaf blower does get the job done. The only reason in our opinion why it is not a 10 out of 10 product is the price. It is slightly higher than the average price point for this type of blower. If you the potential buyer want a leaf blower that can just about blow anything off your garden, then this would be an excellent choice. Nothing comes close to this one in terms of sheer blowing power, thanks to the turbine fan and the high intake setup. It is also good that this one is light and can be used with just one hand. For general gardening purposes we would not buy this one as the consensus from the team here is that we like a blower that can also vacuum and mulch or shred. 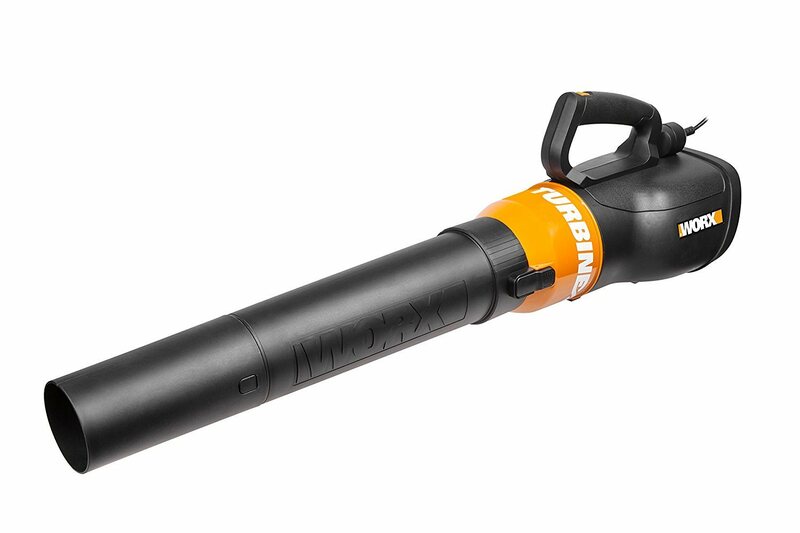 There is no question though that as a blower only, this WORX model will be very hard to beat.